Employees join Cadence because of our innovation, and stay because of our culture. Working at Cadence means working alongside the industry’s brightest people and innovating for some of the biggest companies around the globe. Our employees feel empowered and supported to make their mark on the future of technology. Our culture has earned Cadence recognition as a Great Place to Work around the world, including Fortune's list of the 100 Best Companies to Work For. Our diverse team of passionate, dedicated, and talented individuals go above and beyond for our customers, our communities, and each other—every day. “When I first joined Cadence in 2009, building a high-performing culture became one of my top priorities. As transformative trends like machine learning shape the future of electronics, the opportunity for Cadence to innovate and grow is immense. I am committed to fueling a dynamic work environment where employees feel inspired and empowered to do their best work. This is crucial when it comes to our ability to delight our customers with innovative products.” - Lip-Bu Tan, CEO of Cadence. Cadence has also appeared on the Great Place to Work Institute’s Best Workplace lists for 12 countries, resulting in recognition as a World’s Best Multinational Workplace, as well as Best Workplace lists for Millennials, for Giving Back, and for Parents, among others. Cadence has prepared the fiscal 2018 Sustainability Report that provides information on its environmental, social, and governance strategy, programs and activities. Customers are at the heart of everything we do—they are our passion and our pride. We work at Cadence to make a difference—to influence the future of innovation. We encourage each other to think big, take risks, and make an impact. We are focused, disciplined, and continuously strive for exceptional results. We embrace change. We are decisive and move quickly to keep pace with our customers and outpace the competition. We hold ourselves accountable to do what is right and to deliver on our commitments. We are authentic and trustworthy. If we respect one another and work together, we are unstoppable. Cadence celebrations come in many forms, from product launches and cultural events, to team outings and employee work anniversaries. We take opportunities to celebrate personal and team achievements to remind employees how valuable they are to the team. 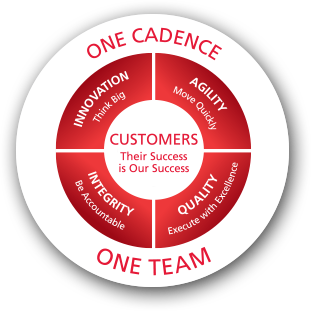 Cadence values the camaraderie and fun that enables us to work together as one high-performing team! "Cadence is a company of very capable people with a passion for technology. Beyond that, they are some of the friendliest people I have had the pleasure to work with." "This company wants its employees to have a good career and lead a good life." "Not only does Cadence focus on our external customers’ success, but the company is committed to promoting and advocating the very best for its employees." "The corporate culture is One Cadence—One Team and we are living this every day." "From the moment I joined the company, I’ve been welcomed with open arms and made to feel like part of the Cadence family." "You have the personal empowerment to impact change and make a positive difference for Cadence and our customers." As our CEO, Lip-Bu Tan, will tell you, “It is the drive, passion, intelligence, and integrity of our dedicated employees that make Cadence a great place to do great work.” Cadence is recognized as a Great Place to Work around the world, including on FORTUNE Magazine’s list of the 100 Best Companies to Work For. Our diverse team of passionate, dedicated, and talented individuals go above and beyond for our customers, our communities, and each other—every day. Employees join Cadence because of our innovation, and stay because of our culture. Every day brings exciting challenges in an ever-evolving industry. We believe in creating an environment where everyone is empowered to do their best work, surrounded by the best team. Cadence has been at the leading edge of the electronics revolution for over 25 years and continues to propel it forward. Cadence enables global electronic design innovation and plays an essential role in the creation of today"s integrated circuits and electronics. Customers use Cadence® software, hardware, IP, and services to design and verify advanced semiconductors, consumer electronics, networking and telecommunications equipment, and computer systems.